Knowledge of Git, Maven, Linux will be preferred but NOT required. This course is very hands-on, James has put lots effort to provide you with not only the theory but also real-life examples of implementing continuous integration pipeline that you can try out on your own laptop. James has uploaded all the source code to Github and you will be able to follow along with either windows, MAC OS or Linux. In the end of this course, James is confident that you will gain in-depth knowledge about Jenkins and general DevOps skills to help your company or your own project to apply the right Jenkins workflow and continuously deliver better software. 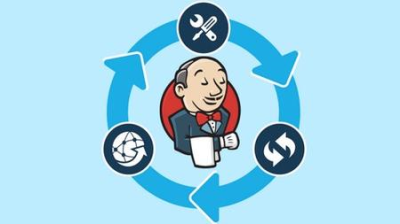 Implent an automated continuous integration pipeline to build, test, analyze and deploy a web-based application with Jenkins. Create a multi-stage Jenkins job and visualize the complicated build pipeline with Jenkins build pipeline plugin. Integrate continuous integration builds with other tools such as Java, GitHub, Maven and Tomcat in a more comprehensive software delivery strategy. Scale Jenkins workflow with Jenkins' master and slave architecture, deploy and configure a multi-node Jenkins cluster in the cloud for labeled builds. Learn how to configure and extend Jenkins functionality with Jenkins plugins such as copy build artifacts plugins and deploy to container plugins, etc. Invaluable DevOps skills such as setting up staging and production environment for continuous integration workflows. In-depth knowledge about Jenkins and confidence to help your company or your own project to apply the right Jenkins workflow and continuously deliver better software. Prior experience with Jenkins is NOT required. Desire to learn something new. Anyone who want to fully understand how Jenkins works and learn how Jenkins is being used in the field. DevOps, developers or IT admins who want to advance their career by improving their DevOps skills.